Hypnosis and hypnotherapy are two different entities. Hypnosis is an alternated state of consciousness that may have certain temporary beneficial effects, such as tension reduction but is not itself designed for that purpose. Hypnotherapy is a treatment modality with specific therapeutic goals and specific techniques utilized while the patient is in a state of hypnosis. 1. Someone with an I.Q. below 70 or severe mental problems. 3. Someone that just does not want to be hypnotized. You cannot force anyone to do anything they are not willing to do. If you are willing and you want the changes, then all you really need to do is relax and allow the positive suggestions to unfold. How will I know I have been hypnotized and how will I feel in a hypnotic state? During hypnosis, your body is deeply relaxed. You may feel lightness, heaviness or sometimes a tingling sensation. Many individuals actually cannot tell the difference between a hypnotized state and a waking state. Yet, you may simply feel deeply relaxed. You may have a distortion in time, where you felt the process was much longer. Just remember that you are not asleep, but your mind is highly focused and attentive. Hypnosis can assist a person achieve a focused state of mind, by encouraging the rational, critical mind to temporarily relax. Therefore, this creates a highly suggestible condition in which the positive suggestions can have a powerful effect upon the individual. 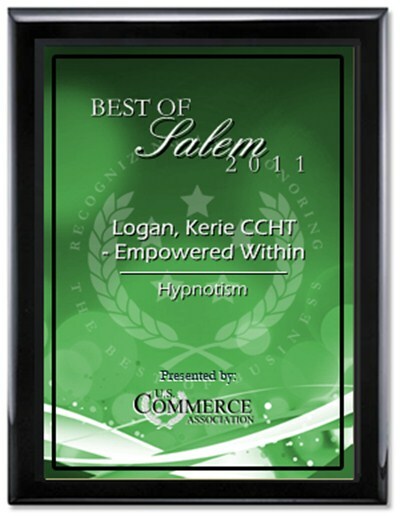 How does Empowered Within incorporate hypnosis for my Success? In the state of hypnosis, I incorporate carefully personalized suggestions based on each specific topic. I integrate positive suggestions for change, while focusing on dissipating and dissolving any negative habits, negative beliefs and self-imposing limitations. Eventually the self-imposing limitations lose their grip, while the positive begins to drive your conscious thinking, actions and beliefs. Hypnosis will and can assist you in gaining the ability to break through your own self-imposed limitations. I have utilized hypnosis and it assisted me in breaking free of the shackles of my past, present, and future negative patterns. I assisted me in staying focused, believing in myself, healing others, and making a positive difference in people’s lives. What if I am too strong willed to be hypnotized? Several people believe that only gullible or weak-minded people can be hypnotized. Nothing could be farther than the truth. In fact, the reverse is true. Intelligent and strong-willed individuals are generally very successful with utilizing hypnosis. In the Discover Magazine, it showed that the more whites of your eyes show when looking upward, the more easily you may be hypnotized. Remember, hypnosis is only self-hypnosis. You can accept or reject the positive suggestions. Your success comes from your ability to use your imagination, listening and following directions. If you find your mind wandering during hypnosis, learn to quiet your mind and simply listen. Learn to concentrate on your breathing in order to relax your body. The more you practice hypnosis, meditation, deep relaxation and/or stress reduction, the easier it will be for you to benefit from hypnosis. You can either be directly suggestible (follow directions easily) or inferred (strong willed). Since I am inferred, I just remind myself each time I utilized hypnosis that this is something I really want. Therefore, all I really need to do is relax, listen and imagine.